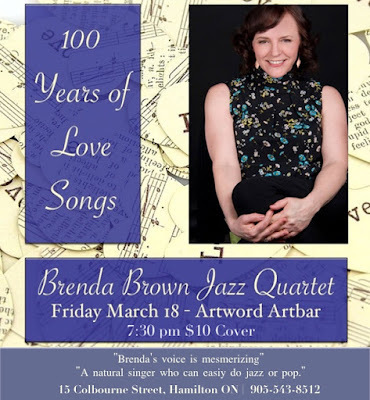 Hamilton Music Award nominee Brenda Brown studied Music at Mohawk College and Laurentian University. Her smooth, warm, and expressive voice has been sought after for audio books as well as lighting up her discerning choice of musical repertoire. Brenda's uplifting and fresh style never disappoints. In her recording debut Brenda teamed up with multi-instrumentalist/arranger Ross Wooldridge. It is a refreshing cross­ section of North American Songbook tunes and some original material. The Brenda Brown EP garnered a nomination for Jazz Recording of the Year at the 2015 Hamilton Music Awards. Brenda is now in rehearsal preparing to record an exciting new collection of recordings. Production will commence in Spring 2018 and release date is TBA. “A natural singer who can easily do jazz or pop." C.J. "Thank you! Thank you! Your beautiful music and velvet voice made our wedding so special! All of the guests commented on your sound and selection of songs." D.B. "Brenda’s voice is mesmerizing. My visitors and I had a thoroughly enjoyable evening with the classy duo." M.K.